Easter is one of the best spring holidays and one I really love to craft for. All the pretty colors, bunnies, chicks, eggs, and a great message, if you into that ;). Recently, I received a Silhouette Cutting Machine and it has quickly become my favorite crafting tool ever. 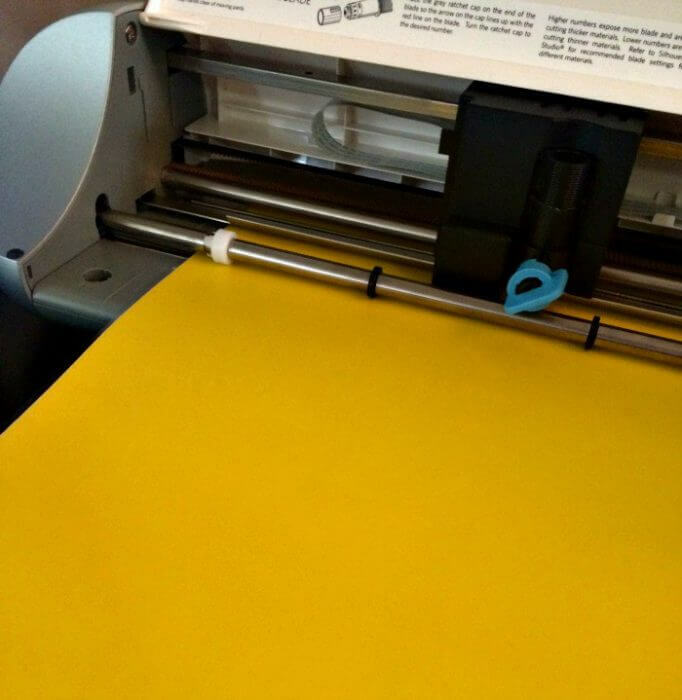 This thing can help you make homemade cards, custom shirts, banners, wall art and more. 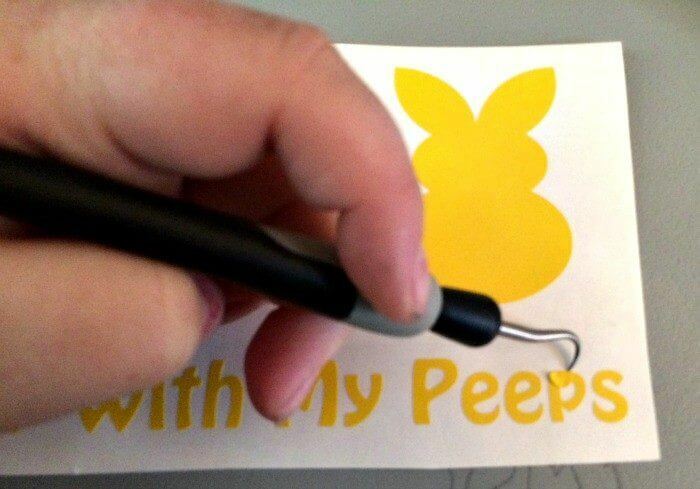 SO when it was time to start thinking about Easter Crafts I knew I had to make something awesome with my Silhouette cutter. 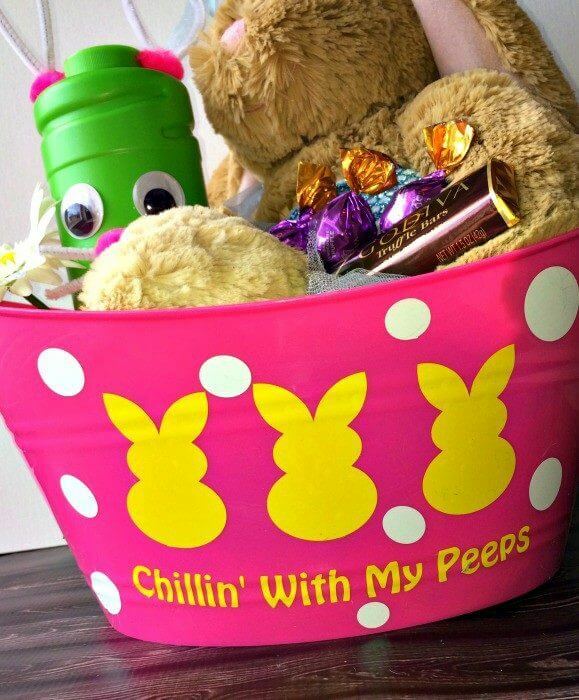 My daughter LOVES Peeps, so I thought it would be cute to make her a Peeps themed DIY Easter Bunny Baskets! I made a simple SVG file (that I’m going to be sharing with you!) 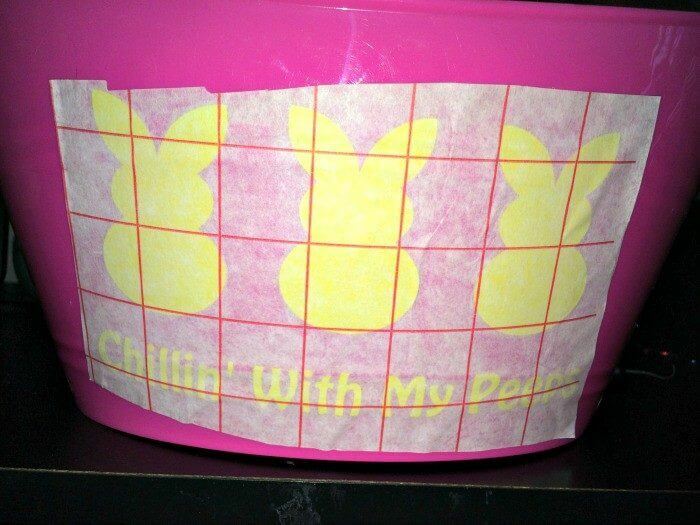 and grabbed this really cute Easter bucket from the dollar tree and got to work! If you already have a Silhouette cutting machine and know how to work it, you know how easy this project is, and if you haven’t used yours yet keep reading and I’ll show you how easy it is! First, you gotta cut out that design! You will be using 2 different colors of vinyl. I used Yellow for the Peeps and White for the dots. Next, It’s time to “weed” that design. If you haven’t heard of weeding before, it just means that you will be taking out all the unnecessary parts of the design. 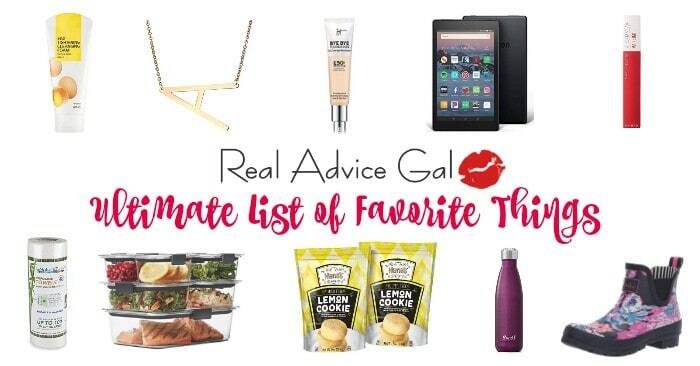 (I.E the middle of letters). Next, You will peel the design off the backing and add it to your bucket. 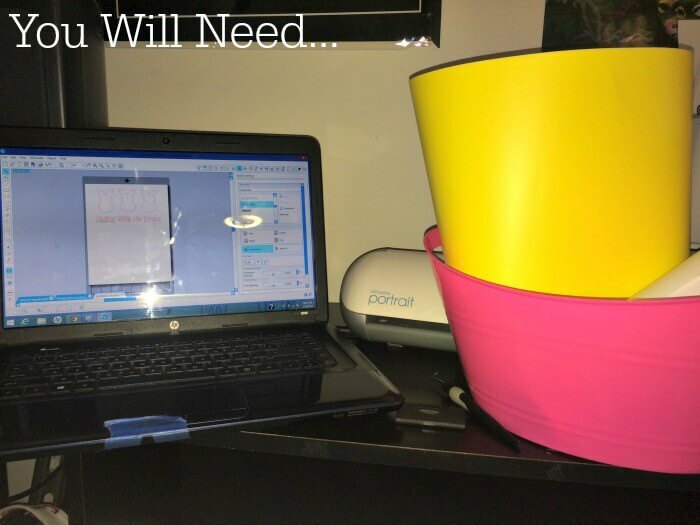 Make sure you have no bubbling areas by using a card to smooth your design on to your bucket. Finally, you will add your dots! 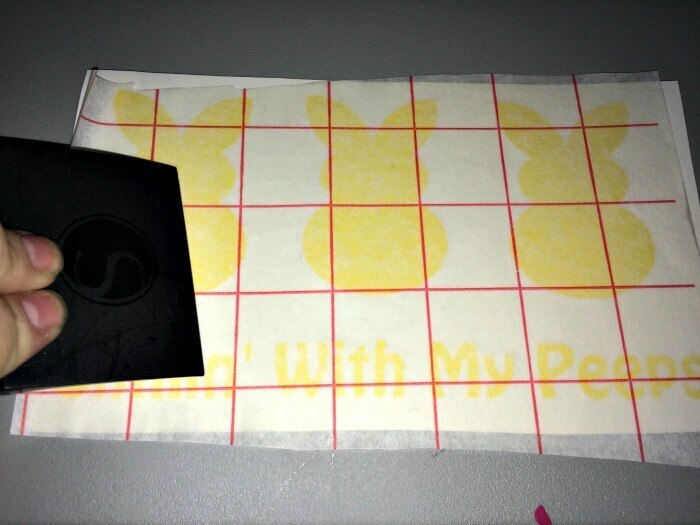 I personally don’t use transfer paper for my dots, I just peel and stick em’ where I want them. It’s easy and it doesn’t waste transfer paper. Do make sure you press them on firmly though, so they don’t peel around the edges! And that’s it! 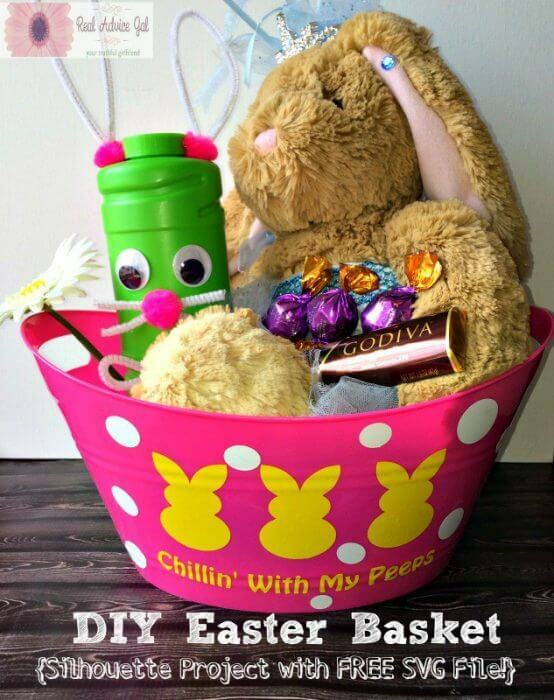 After about 20 minutes of work you have a super cute and custom Easter Basket your kids are sure to love! How easy is that right! ?